Porsche Design Group (Porsche Lizenz- und Handelsgesellschaft mbH & Co. KG) and LaCie announce the latest technology to join the luxury brand's exclusive P´9000 electronics category: the LaCie Porsche Design Mobile (P'9220) and Desktop (P'9230) Hard Drives. The new storage accessories represent cutting-edge USB 3.0 technology, sleek aluminium frame, and purist design. Since 2003, LaCie and Porsche Design have worked closely to deliver products that are technically inspired, delivering flawless functionality in its purest form. The luxury brand and the leading technology company complement the other, with technical influence from LaCie, together with an exclusive and timeless shape presented by Porsche Design. "For 20 years LaCie has introduced products that influence and fit right into our digital lives," says Dr. Juergen Gessler, CEO of the Porsche Design Group. "Since 1972 the Porsche Design luxury brand embodies that philosophy in everything that we have created, bringing a sense of quality and luxury to every single Porsche Design product. We are pleased to introduce a product that resembles superior form and functionality." Today the luxury brand and the leading technology company announce the evolution of LaCie's portfolio designed by Porsche Design, by introducing a new generation of storage solutions. Delivering more than just industry-leading performance, the new design is a combination of premium material and workmanship that completely reflect the Porsche Design signature. For Porsche Design, the authenticity and quality of materials further exemplify the components inside. The aluminium frame of the LaCie Porsche Design Mobile and Desktop Hard Drives is elegant by appearance, but supports the vast functionality of the hard drive inside. The LaCie Porsche Design Mobile and Desktop Hard Drives are built with durable and scratch-resistant aluminium, protecting the hard drive mechanics. Each frame is built with precision. The aluminium also regulates heat for guaranteed performance. And for the environment, the aluminium frame is 100 percent recyclable. Clocking speeds three times faster than USB 2.0*, The LaCie Porsche Design Mobile and Desktop Hard Drives are the fastest USB 3.0 hard drives on the market. Technology enthusiasts will appreciate transferring their digital assets in seconds with no delay to their digital lifestyle, delivering peak performance and pure design. More than just a beautiful exterior, LaCie Porsche Design Hard Drives come with software to easily install your drive on PC and Mac. Each drive includes backup software, to ensure you have a complete backup of all your digital assets, eco mode for power savings, password protection to keep files secure and 10GB of Wuala secure online storage. 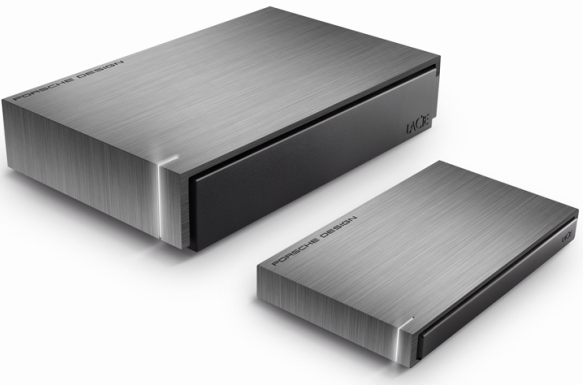 The LaCie Porsche Design Mobile Hard Drive (P'9220) comes in 500GB and 1TB capacities. Additionally, a 750GB model will be available exclusively in the worldwide Porsche Design Stores. The LaCie Porsche Design Desktop Hard Drive (P'9230) comes in 1TB and 2TB capacities. The products will be available through the LaCie Online Store and select retailers including Amazon, B&H, Best-Buy.com, and Micro-Center, starting at $104.99. Porsche Design is a luxury brand with a particular focus on technically inspired products. The Porsche Design brand was established in 1972 by Professor Ferdinand Alexander Porsche. The products stand for functional, timeless and purist design, characterised by their technical innovation. The product portfolio includes watches, sunglasses, luggage, a fashion collection for men and women as well as sports apparel, electronic products and a men's fragrance line. All the products under the brand are designed at the Porsche Design Studio in Zell am See (Austria) and are available worldwide in the company's own stores, franchise stores, shops-in-shops, high-end department stores and exclusive specialist retailers.